Drivers in Shrewsbury will enjoy smoother journeys thanks to a new multi-million pound relief road approved today by Transport Secretary Chris Grayling. 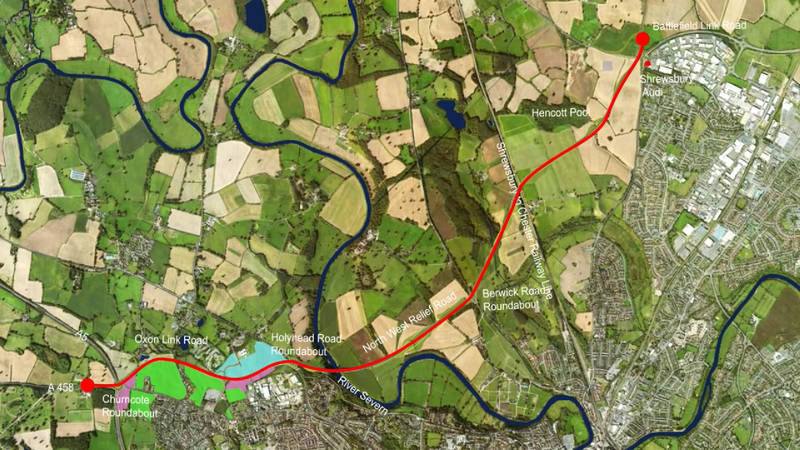 The £54 million North West Relief Road – between Battlefield Link Road and Oxon Link Road – will provide a new, single-carriageway route taking traffic out of the town centre. This will not only significantly reduce congestion, but it will also lead to improved air quality in the town centre. “We very much welcome news of this multi-million pound investment into Shrewsbury’s infrastructure, which will have long-lasting benefits to the local economy. “There are ambitious plans for improving Shrewsbury, as outlined in the Big Town Plan, and one of the priorities is to make movement in and around the town centre better for everyone. This involves better pedestrian and cycle routes, and reducing through traffic in the town centre. The North West Relief Road will be a big step towards that vision, as it will allow greater traffic flow around Shrewsbury and lessen the need for people to drive through the centre. Read more on the Shropshire Council website. Read more on the Department for Transport website.